This blouse was one of the pieces from the Target/Neiman Marcus collection that I really wanted. 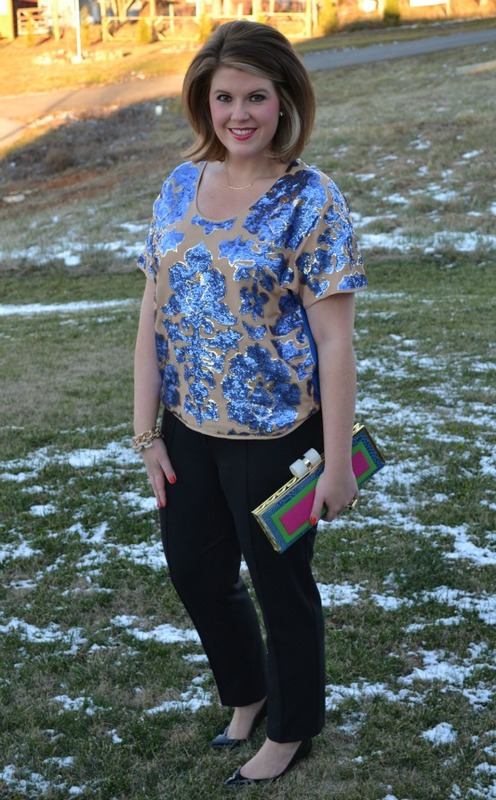 I loved the bold sequin pattern and color combination. My parents and I had a surprise birthday party to attend last weekend - it was a great opportunity to pull this baby out! 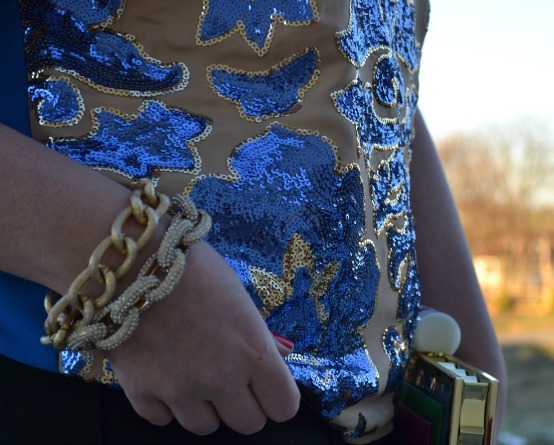 I paired it with simple black pants and heels, an art deco-inspired clutch and glitzy (but minimal) gold jewelry. This outfit was the perfect juxtaposition against the barbecue restaurant atmosphere. PS - This is my 1000th post! Perfect little number to celebrate, huh?! Love this outfit! The ring is so beautiful! Totes had my eye on that top! So cute. Love a little sparkle in my life. love this!!! i had so debated buying this top and wish i had now! You look gorgeous! 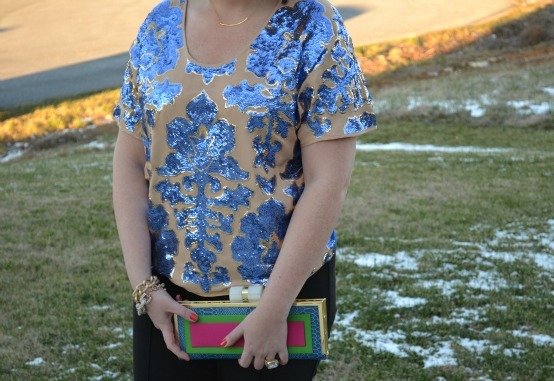 I was in love with the bold print and the sparkle! But decided to purchase the ODL tote instead. Congrats on your 1000th post! That is such an accomplishment! 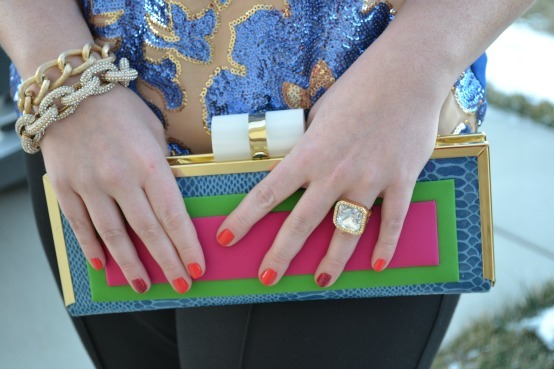 Love your colorful clutch and sparkles, too! So you rocked that top! I love it! That deco clutch is seriously the most. I am in love! You look so good in that top! I tried it on and it didn't look nearly as lovely on me. Julie, you look absolutely fantastic! 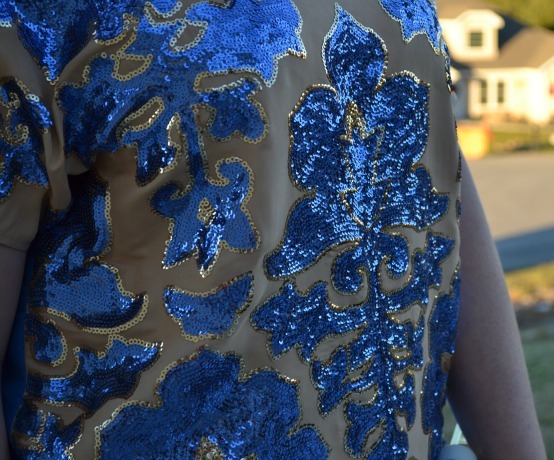 I love everything with sequins, and this is such a perfect way to incorporate them into everyday wardrobe! So chic! I was so close to buying that top when I saw it at Target and now I am seriously regretting not snapping it up! You look lovely!